A sheet pan meal for four, no deep fryer necessary. There are so many reasons to favour this fish and ‘chips’ recipe over the standard variety, including that since this baked-not-deep-fried meal is prepared in a healthier way and includes more vegetables, we feel we can eat it more often. Beyond that, it’s also easier. No messy pan-frying involved and no special contraptions either. 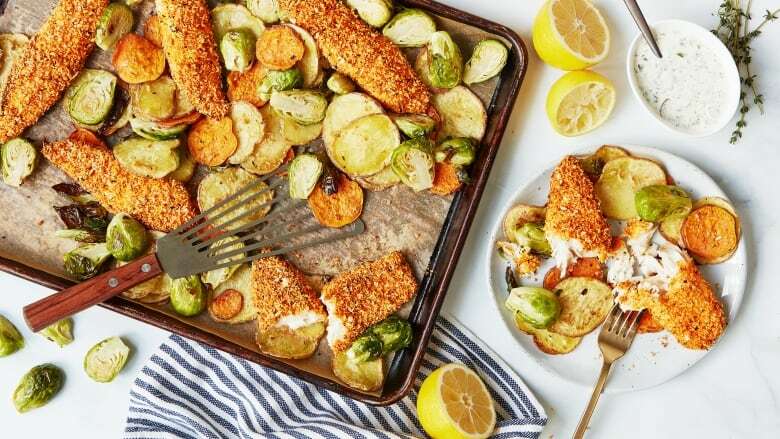 It’s a sheet pan meal that’s bound to please breaded food fans (everyone), so it’s probably bound for your regular recipe rotation too. Tossing the bread crumbs in oil before breading the fish gives it a delicious golden brown coating when it bakes in the oven. You can substitute the Panko bread crumbs with fresh or dried bread crumbs. Preheat oven to 425F degrees. Toss together the potatoes, sweet potatoes, 2 tablespoons of oil, and 1/4 teaspoon each of salt and pepper, until well coated. Stir in the Brussels sprouts. Arrange them all in an even layer on a large parchment paper-lined baking sheet. Bake, stirring occasionally, until the vegetables are just tender, about 12 to 15 minutes. Meanwhile, in a shallow dish, stir together the yogurt, mustard and Worcestershire sauce. In another shallow dish, stir together the panko, remaining 4 teaspoons of oil, thyme, garlic powder, chili powder, and the remaining salt and pepper. Pat the fish dry with a paper towel. Dip each fish fillet into the yogurt mixture, then coat in the bread crumb mixture. Move the vegetables to one side of the baking sheet and place breaded fish in the empty space, spacing at least 2-inches apart. Bake until the fish starts to flake and is cooked through, and the the vegetables are tender and golden, about 10 to 12 minutes. Meanwhile, stir together the yogurt, lemon zest, lemon juice, olive oil, hot sauce, green onion, parsley, gherkin, capers, garlic, salt and pepper. Serve the Fish and Chip Sheet Pan Dinner with the tartar sauce and lemon wedges.